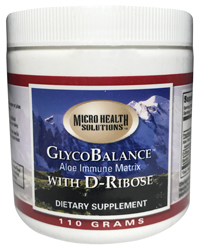 GlycoBalance™ Aloe Immune Matrix with D-Ribose, manufactured by Micro Health Solutions, provides more benefits than the original GlycoBalance Glyconutrients formula! This product has been reformulated to provide a more potent and concentrated composition which means less amount is required to achieve positive results. This formula contains D-Ribose, a naturally-occurring 5-carbon sugar. D-Ribose is a primary building block in the production of ATP, the body’s main energy source. Unlike glucose, D-Ribose does not raise blood sugar levels. Other Ingredients: Stevia extract powder 200:1 and natural flavoring powder. Contains no added sugar, starch, preservatives, artificial colors, flavors or additives, corn, wheat, yeast, soy or dairy.